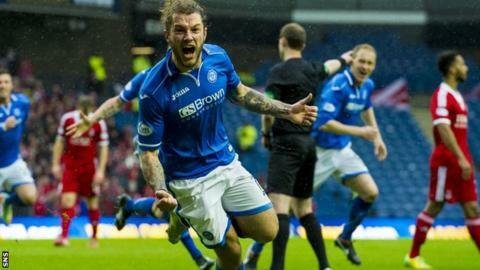 Stevie May says confidence is high in the St Johnstone camp that they will win the Scottish Cup. The striker secured Saints' first Scottish Cup final appearance with a semi-final double against Aberdeen. They face Dundee United in the final on 17 May at Celtic Park, and May revealed hopes are high that the Perth men will lift their first major trophy. "We've said from the start we've all got a feeling this could be our year," said May. "But you can't take anything for granted or be over-confident. We are quietly confident as underdogs. "It's hard to put the Scottish Cup final on the back burner, but that's what we have to do because there's still places to fight for in the league." May has scored 27 goals in all competitions this season, but the 21-year-old missed out on being named PFA Scotland young player of the year. The St Johnstone star was shortlisted, but Dundee United defender Andrew Robertson won the award. "It would have been nice to get the accolade but I'm not going to let it affect me," added May. "We've got a lot of important games left this season and that's what I'm looking forward to now."